If your home could talk to you, what would it say? Answer: Whatever you want. 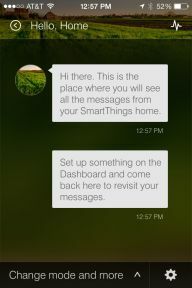 That’s because the Hello, Home feature of the SmartThings app allows you to communicate with your home, teach it to react to your unique daily patterns, and then receive a message from your home telling you the different actions it’s performed based on your preferences. Here, we’ll guide you through how to set it up Hello, Home (the actions taking place in and around your home), and learn about how it works with Modes (the state of your home) to make your home more intuitive and automatically react to your daily routines. In the top right corner of the mobile app, you’ll see a red speech bubble with some number in it. Tap that bubble and you’ll be taken into Hello, Home which is where your home can tell you what’s going on and you can tell your home how you want it to behave. It’s also where you’ll receive updates about everything that is happening in and around your home. You’ll be presented with some instructional screens that are very helpful, so take a moment to read them. If you’ve already triggered some events to take place when you say a phrase to your home, you’ll see a set of those messages already populating Hello, Home–like alerts on doors being open or the area underneath the kitchen sink being wet. These are examples of your smart home speaking to you and letting you know what’s going on. By scrolling up, you can go back in time to see what’s happened in the past. Hello, Home works by reacting to different pre-set phrases that you send to your home. You can customize what happens when you select these different phrases. In this sense, Hello, Home is kind of like texting with your home. 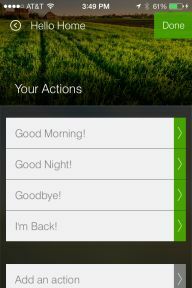 But you can also receive Hello, Home messages if you don’t select a phrase to communicate to your home. 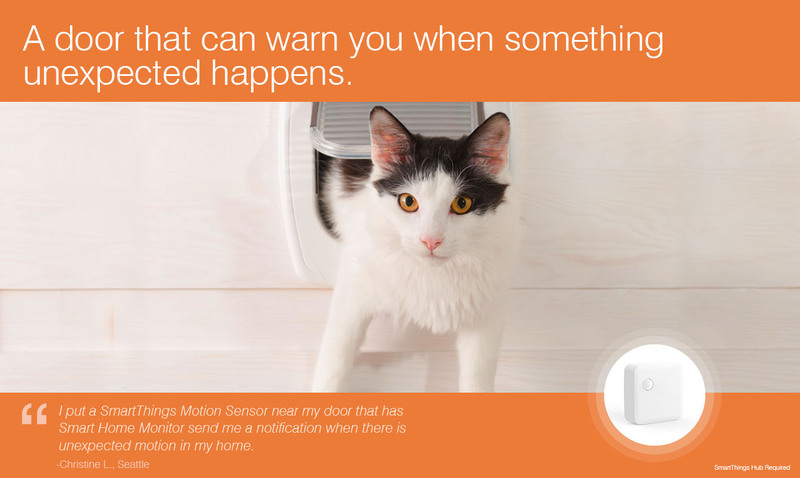 Anytime that different things happen in and around your home (a family member arrives, a door opens, motion is detected, etc), it will appear in your Hello, Home conversation. You can also add as many personal phrases as you want, but these four default phrases provide a good starting point. 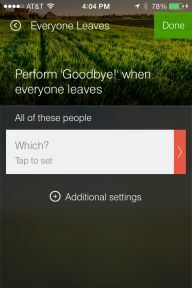 So for example, if you previously set up a motion sensor to only send alerts/notifications when you are in “Away” mode, then by default, “Goodbye!” will change you into “Away” mode – thus granting your motion sensor permission to let you know what’s going on. 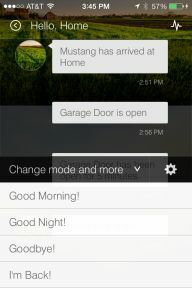 Likewise, “I’m Back” will trigger “Home” mode, and “Good Night!” will trigger “Night” mode. 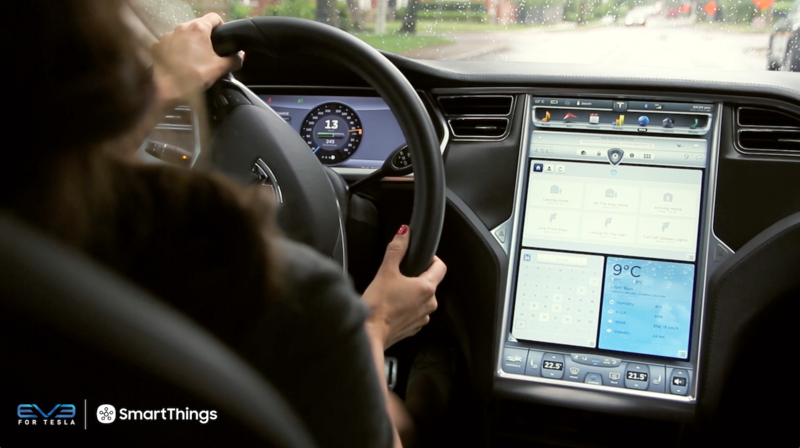 As a note: Everything you set up in the dashboard will default to working in ALL modes unless you tell it otherwise. So please keep that in mind. • When in “Home” mode, I want a motion sensor to turn on a light. • When in “Away” mode, I want the same motion sensor to send me a text message as a security warning and turn on an alarm. • When in “Night” mode, I want that motion sensor to turn on a light and send me a text message. 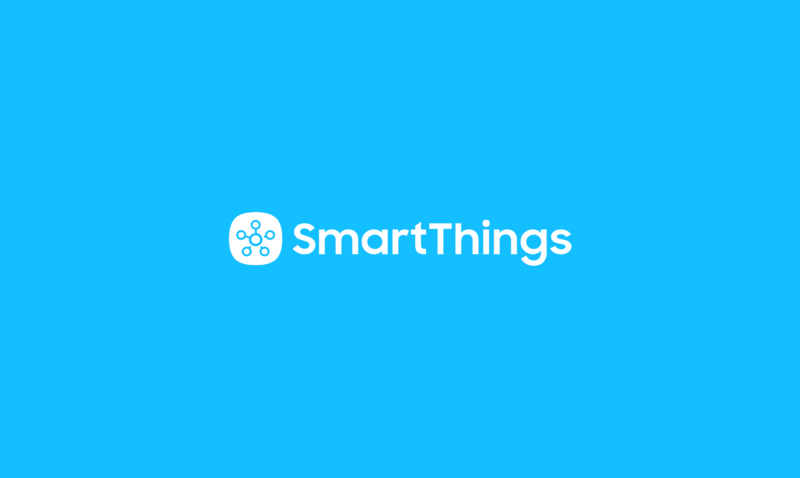 For nearly every configuration in SmartThings, you can select “More options” and limit that configuration to only happen during a specific mode. This provides an enormous range of possibilities. While the initial lineup of phrases and modes may seem obvious and redundant, phrases and modes are not always the same. For instance, some people create a personal phrase which is simply “Kids are at School” which will trigger lights in the kids’ rooms to turn off as they leave for the day, but doesn’t correspond to a change in the mode for the entire household. As another example, a phrase could be used to turn down the thermostat in a back area of the house when there is no more motion, even though a mode change is not warranted. We’ve already talked about how “Hello Home” is a great way to build intelligence into your home. Now, we’ll dive into how you can use it with Modes. 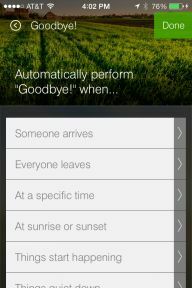 For example, you can start by changing the mode to “Away” automatically using the “Goodbye!” phrase. 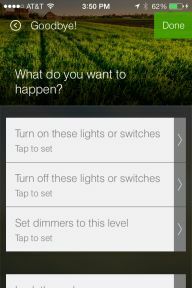 Tap the icon in the upper-right corner of the mobile app and then select the gear icon at the bottom of the “Hello, Home” screen, then select “Goodbye!” Go ahead and tap the option to “Turn on these lights or switches” and choose any lamps you want to control. So, you can tell your home to say “Goodbye!” when you leave for the day based on your mobile phone arriving in the range you’ve set for your home location, or the SmartSense Presence sensor you keep in your car. 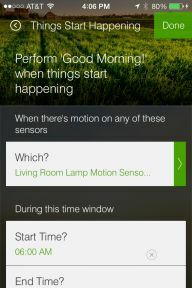 Here’s another creative use of SmartThings modes and Hello, Home phrases: You can tell your home it’s time to say “Good Morning!” when there is motion detected in a particular location after a certain time in the morning. This will also bring you from “Night” mode to “Home” mode automatically, so that motion sensor you set up as a security device returns to simply turning on lights. The “Things Quiet Down” experience is the opposite, where a phrase can can be triggered after motion has stopped. 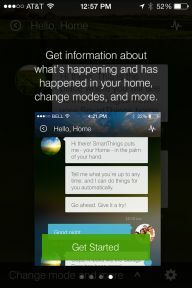 To test your “Hello, Home” phrase, simply choose “Change mode and more” and manually trigger the phrase by tapping it. You’ll see when you tell the home “Goodbye!” and the home responds, confirming it’s done what you asked of it. The same would happen once you leave. 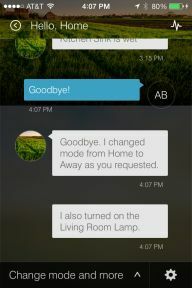 For example, if we said we only want to receive motion notifications when we’re in “Away” mode, and since the house is now in “Away” mode, that same motion event will now create a notification in “Hello, Home,” a push notification, and a text message if you’ve set that up. Here are some common and creative uses of the combination of “Hello, Home” phrases and modes. • When there is motion in the kitchen, and it’s after 6AM, say “Good Morning!” and go into “Home” mode from “Away” mode. 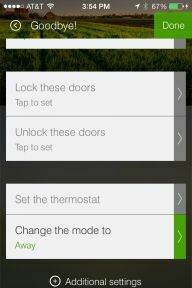 Turn on lights in the kitchen, turn up the thermostat and disable security settings from “Night” mode. 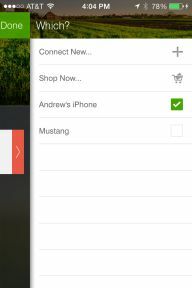 • When both a phone and a SmartSense Presence sensor leave, trigger “Goodbye!” and go into Away mode. Now react to motion and open/closed events with more security. 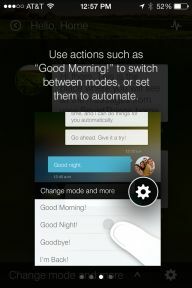 • When there is no more motion after 11PM, say “Good Night!” and go into “Night” mode. • When there is no more motion in one area of the house, turn down that thermostat and turn off the lights but do not change the mode. A home that reacts to you, makes you more secure and comfortable, and saves you money. It’s not a Jetsons home. 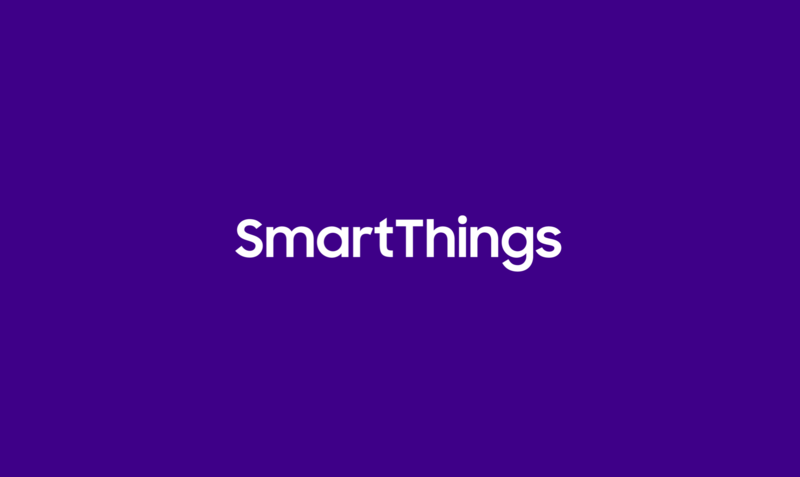 It’s a SmartThings home.